August seems to be the month that only the die-hard cyclists can still be found around town. At least it seems that way here in the midwest. The summer is coming to a close, schools are back in session, and the temperature can still be raising the mercury by mid-day. Velo Junkie and I had a vacation to Key West planned for mid-August, a spontaneous reservation made after a night at our favorite neighborhood brewery. Due to circumstances beyond our control (sort of) we decided going out of town was not the best decision, so we canceled the trip, but not the time off from work. You see, I had adopted two pups that needed rescue - both under a year old, and both over 65 pounds. The two of us also had work obligations that required multiple overnights on both sides of the scheduled get-away, so a late summer staycation it was for Velo Junkie and the Reluctant Cyclist. This did not discourage, nor disappoint, as we had plenty of adventures to keep us busy close to home. One of those was our annual bike ride on the Cardinal Greenway Trail to Scotty’s Brew Pub in Muncie, Indiana. The Cardinal Greenway Trail is a Rails-to-Trails path that starts in Richmond, IN and travels north, past Muncie. Scotty’s Brew Pub is a friendly place in the college town of Muncie that has many beers on tap, including their own brand, Three Wise Men. Velo Junkie and I have been making the trek annually for about six years now. The beer is always worth it, but the Shewman, a large burger topped with cheddar, jalapenos, and peanut butter, is the perfect sandwich to satisfy the appetite after a warm, thirty to forty mile ride through the agricultural heartland of the Hoosier state. This year we opted for a sixty mile ride starting at the Williamsburg trailhead. The late summer morning was cool and dewey, the kind that fogs up your glasses and makes your skin feel clammy in your kit. The canopy was still lush, although the shortened days had caused the trees to start shedding leaves. The sun was low in the morning sky behind us, casting long shadows in front of our handlebars as we cantered off on our northwest expedition. The shade of the trees faded fast as the sun quickly rose high above the agricultural fields of Indiana, rich with feed corn nearly ready for harvest. As we rolled along the trail we were greeted by the hues of many butterflies feeding off the nectar of the purple and fuchsia bull thistle (Cirsium vulgare), including many orange and black Monarchs (Danaus plexippus) stopping to refuel during the migration to their winter home in Mexico. Scurrying chipmunks crossed our path while readying their burrows for the coming seasons, and finches flew low around us, darting from flower to flower for the precious, ripe seeds that August brings. A detour took us through the The Red-Tail Nature Preserve, a beautiful, natural area and wildlife sanctuary. Velo Junkie and I were confused at first because the trail is hidden amongst the high grasses of the prairie. It was a short ride through the preserve, one that I would have liked to have lasted a little longer. By the time we reached Scotty’s Brew Pub we were ready for nourishment and a cold, refreshing beer. Blonde Bunny, a blonde ale, was the perfect accompaniment to the Shewman. After our satisfying lunch we turned our bikes southeast for the warm, leisurely ride back to the trailhead. The butterflies and bees were still busy around the abundant thistle. 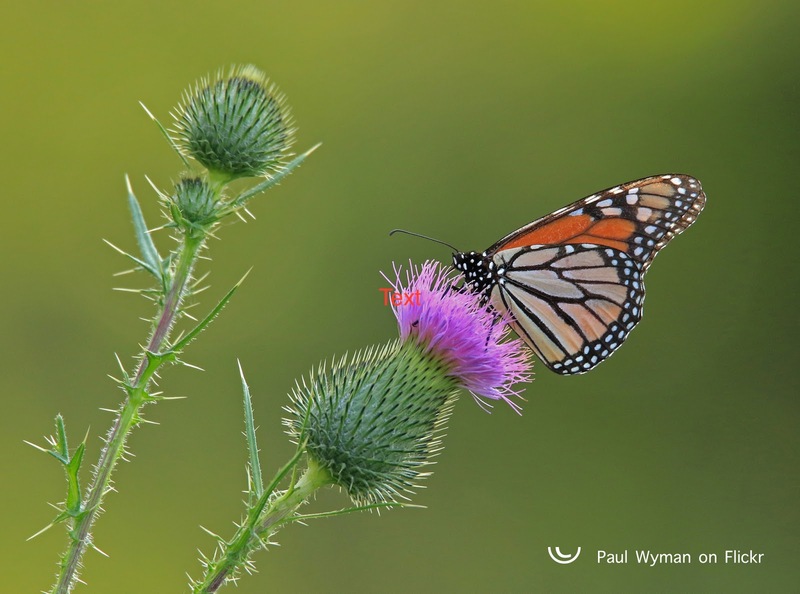 I couldn’t help but consider what we, as the human race, can do to help prevent the extinction of the delicate but magnificent Monarch butterfly. 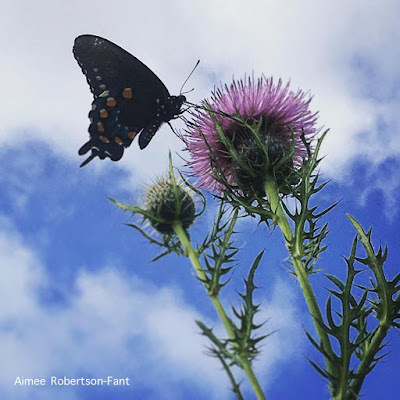 If you read this blog, please share your ideas, and what you have done for preservation of butterfly habitat and wildlife corridors in your community.